The Samsung Galaxy Ace Style features a 4 inch display with a resolution of 480 x 800 pixels with a pixel density of 233ppi. It has a colour count of 262k and has good viewing angles. Samsung's Galaxy Ace Style sports a 5 megapixel auto-focus camera and a basic front facing VGA camera. The camera interface can either be launched via the icon or straight from the lock screen. There are buttons for still images and for video capture. Another button will give access to shooting modes such as night, sports, panorama, continuous shot and anti-fog. The device arrives preloaded with ChatOn function allowing images to be sent to friends and family whilst on the move. The compact device has a matte plastic build and has a vertical stripe on the reverse. 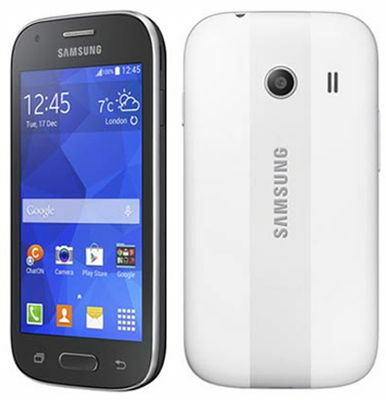 The solid and compact Galaxy Ace Style measures 4.77 x 2.47 x 0.42 inches and weighs 4.34 ounces. The device fits comfortably in the hand and is easy to use one-handed and being fairly lightweight is ideal for the pocket or bag. The Galaxy Ace Style has a large physical home key on the front with a lock key on the top right, with the volume rocker to the left. In terms of operating system, the Samsung Galaxy Ace Style runs on Google’s KitKat and features the latest of Samsung’s TouchWiz user interface. The device has a 1500mAh removable battery providing a talk time of up to 8 hours on 3G and a standby time of just over 12 days. The Galaxy Ace Style has a 1.2GHz processor and 512MB of memory together with 4GB of internal memory with a microSD slot for up to 64GB of expandable storage. It also arrives with Bluetooth4.0, Wi-Fi and NFC.